In the Niagara Peninsula, home owners are becoming more educated on the science behind insulation, including resistance to heat loss (i.e., R-value). Because the R-value of fiberglass depletes with time, many home owners are looking to remove their old insulation and replace it with spray foam. In addition to wanting to insulate their homes with the best R-value possible, they want insulation with air sealing properties. Fiberglass doesn’t offer this, whereas spray foam does. These are not the only reasons why home owners are opting to remove their existing insulation. When wildlife nests in your attic, the existing insulation becomes riddled with animal feces and urine. At Insta-Insulation, our attic insulation removal process will thoroughly clean up this mess. We offer free attic insulation consultations to home owners in the Niagara Peninsula. Give us a call today at 1-800-668-0311 or message us at info@instainsulation.com. We look forward to hearing from you. 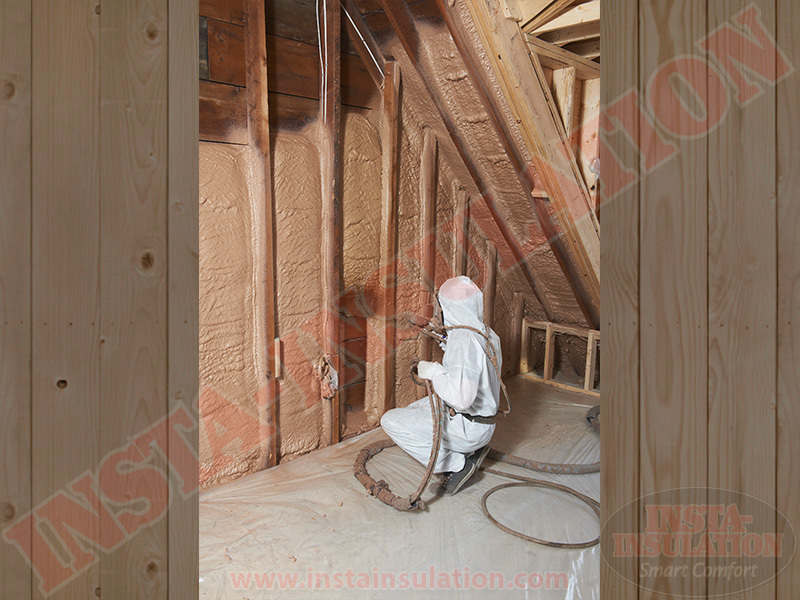 In addition to our attic insulation removal service, Insta-Insulation offers insulation installs and upgrades. Whether you are looking to install, upgrade, or remove insulation in your home, Insta-Insulation has you covered. With over 25 years of experience in the insulation industry, we have expertise in all things insulation. We understand how the climate in which you live and how your building is designed and constructed all come in to play to affect indoor heat and moisture levels. We are Bryan Baeumler’s official insulation contractor, and we have also worked with Mike Holmes for over 10 years. Because air infiltration and leakage reduce your home’s energy efficiency up to 40%, it is essential to understand the difference between various insulation systems available on market today. An older approach involves increasing ventilation and adding fiberglass or cellulose into the attic. In many cases, this approach is okay; however, it is not the best option. At Insta-Insulation, if you choose a more traditional approach, we will follow a four-step process that will thoroughly seal and insulate your attic. There are also modern methods available, such as the hot roof system. With this, spray foam is applied beneath the roof, which simultaneously seals and insulates. For all our attic insulation upgrades, we will inspect several key areas in your home before we even begin insulating. We do this because upgrading your insulation is not a one-step process whereby you simply add more fiberglass or cellulose into the attic space. The state of your attic hatch will have an impact on seal and insulation efficacy, and recent roof leaks can also affect the process. Furthermore, we will inspect bathroom and kitchen exhaust fans to ensure the direction of flow leads outdoors. Other ventilation key spots will be inspected, including soffit ventilation. When these steps are not taken, your attic can become infested with mold. Your health and safety are top priority to us, which is why we do what we do when it comes to attic upgrades. Blown cellulose insulation is a system we use in attics to eliminate drafts and air leaks and guard against mold. For all retrofit wall and attic upgrades, we use the blown cellulose product called Climatizer Plus. This shredded cellulose system is newsprint specially treated with Borit flame retardant. This agent also works hard to ensure your attic stays mold free. In addition to this, the cellulose is fiberized, allowing for increased area of coverage and exceptional performance. Spray foam is more than a high performance insulator. It is also an air-sealing product. Because spray foam offers more R-value and air flow control than fiberglass, you will see a drastic improvement in energy savings. How does an up to 20% reduction in energy bill expenditures sound to you? At Insta-Insulation, we apply spray foam insulation in walls, garages, ceilings, crawl spaces, as well as the underside of floors. Moreover, cost of insulation is dependent on several variables, including masking, total spray area, as well as spray foam thickness or R-value. Plus, spray foam helps to increase the resale value of your home. With such a high return on investment, spray foam is an insulation option not to scoff at. At Insta-Insulation, our high-performance spray foam system is already up to par with government environment regulations mandated to come into effect by 2020. From the latest renovation project to health and safety, there are some cases in which old insulation should be extracted from an attic space; for example, adding cathedral ceilings to your home or upgrading electrical wiring in your attic both necessitate the removal of insulation prior to renovation. Once the renovations have been completed, new insulation will need to be installed. In relation to safeguarding your family’s health, if you see any telltale signs of animals nesting in your attic, you should completely remove all insulation in that area. It doesn’t matter if the offending party has been cleared from the space; the feces these creatures leave behind can make you seriously ill if not cleaned properly. In addition to rodents and other animals nesting in your attic, water damage caused by roof leaks need attention. It is easier for water to damage traditional forms of insulation, such as fiberglass, than new systems, particularly spray foam. To protect your family from mold-related health problems as well as safeguard the integrity of the home, removing the affected insulation is critical. Where there is mold, there is a water source. In most cases, mold is an indication there is a water leak behind a wall or other structure. The attic is particularly vulnerable to mold because this is where hot air meets cold air, producing condensation. If this isn’t addressed quickly, the constant dampness in the attic generates a breeding ground for the unsightly spores. If you do notice mold, do not hesitate to call us at 1-800-668-0311, and we can help you with the mold removal process. We work with a mold remediation company during this process. It usually takes three to four days to remove the moldy materials, cover the affected area with anti-fungal agents to prevent mold reoccurrence, and finally install new insulation up to code or higher. We love seeing home owners installing high R-value insulation into their walls and ceilings; however, if the floor is neglected during the insulation renovation process, there could still be unwanted energy losses. Instead of losing heat through the roof, heat will disappear through the cold basement floor. This is why floor insulation is an important factor in home energy efficiency. The Insta-Panels floor insulation system enhances heat retention in the home without the fear of moisture development and migration. With this system, your concrete floors will remain dry and your basement will be less susceptible to mold growth. Our durable, cost-effective system is composed of a fiberglass or steel outer layer, which completely covers R-11 rigid polyurethane foam. Insta-Panels is approved for under slab insulation, and the installation process itself is easy and hassle free. If you’re worried a raccoon or rat will destroy your snowmobile during the summer months, Insta-Sheds has a solution for you. Insta-Sheds builds fully insulated sheds with double steel construction. Because the construction is incredibly durable, wildlife cannot enter your building and make lunch out of snowmobile wires. In addition to keeping wildlife out, our products protect all your stored tools and equipment from condensation exposure, which will ensure batteries and engines will not fizzle out due to water damage. Free from moisture, metal will remain rust free, protecting your investments even further. If you live in the Niagara Peninsula and have any questions regarding any of our listed services, please contact us toll free at 1-800-668-0311. You can also reach us by e-mail.